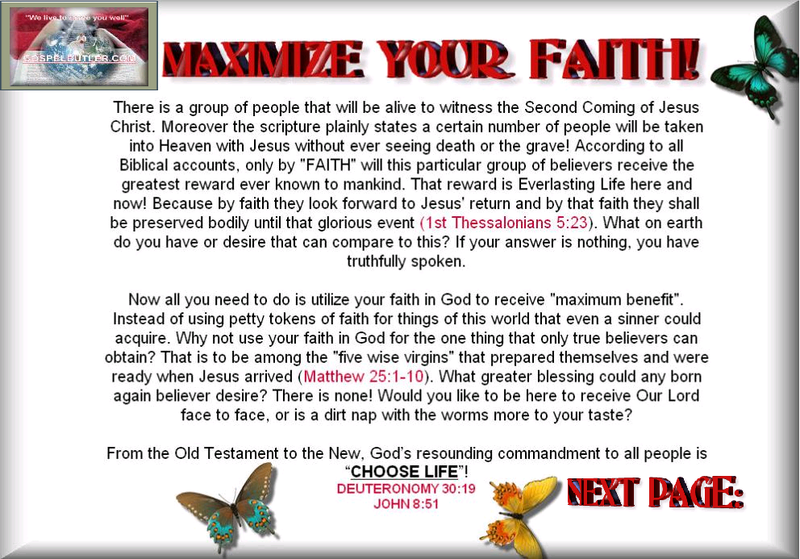 Maximum faith for the maximum goal, beholding the return of Christ! “From faith to faith” (Romans 1:17) admonishes us to exercise our faith by believing in something new, the “deep things of God” (1 Corinthians 2:10)! Give your body to John 8:51 and have faith in God to make it happen. Don’t physically die, choose life (Deuteronomy 30:19). Don’t expect and have faith in the death of your body, expect to physically greet Jesus when he returns (Matthew 25:1-13). Endure to the end and behold his glory with your own eyes (Mark 13:13). The Holy Spirit will keep your body alive to greet Jesus when he returns (1 Thessalonians 5:19-24). It is God’s pleasure to keep you alive and present you to Jesus, face to face (Jude 1:24-25). Look forward to His coming, don’t look back to the ways, belief, and expectation of death and the grave (Luke 9:62). This entry was posted in Enduring to see Christ return!, Living Forever Now!, Never see death (John 8:51), Read between the lines. Understand the deepest meanings., Receiving Immortality and tagged Christ, Enduring to see Jesus come again, eternal, eternal flesh, everlasting body, God, Gospel, health, Heaven, life, longevity, obey, power, sinless flesh, temple of God on November 1, 2012 by literalgospel.